﻿ USA Gymnastics | 2012 Pacific Rim Gymnastics Championships head to Everett, Wash.
2012 Pacific Rim Gymnastics Championships head to Everett, Wash.
EVERETT, Wash., Sept. 6, 2011 – More than 300 of the world's best gymnasts will head to the Pacific Northwest for the first time since 1995 when the Comcast Arena plays host to the 2012 Pacific Rim Gymnastics Championships, March 16-18. Men's and women's gymnastics will be held in the Comcast Arena at Everett, with rhythmic gymnastics and trampoline at the Comcast Community Ice Rink. All-session tickets are on sale now through the Comcast Arena Box Office. Washington Gov. Chris Gregoire, Snohomish County Executive Aaron Reardon, Everett Mayor Ray Stephanson, USA Gymnastics President Steve Penny and legendary gymnastics coach Bela Karolyi attended the official announcement of the event's coming to Everett. "The Pacific Rim Championships will be the largest international gymnastics event held in the state of Washington since the 1990 Goodwill Games," said Penny. "The character of the Pacific Rim is so alive in the Seattle/Everett area, which provides the perfect backdrop to host athletes from all over this region. This event will be a showcase of some of the world's top talent as we get ready for the 2012 Olympic Games in London." The three-day event is expected to feature athletes from more than 14 countries, including Canada, China, Japan, Russia and the United States, competing in men's, women's and rhythmic gymnastics and trampoline. "Hosting an event of this stature is a huge honor for the state of Washington and the city of Everett," said Gov. Gregoire. "It not only allows Washingtonians to be a part of the road to the 2012 Olympics in London, but it also will be a boost for local hotels, restaurants and shopkeepers. This event will bring the world to Washington's door." While the Seattle area has held three major gymnastics events, this is the first time Everett will stage a gymnastics event of this stature. The gymnastics competition at the 1990 Goodwill Games was staged in Tacoma, and Seattle was the site for the 1995 American Cup and 1973 women's national championships. "With the Pacific Rim Gymnastics Championships and 2008's international Skate America competition, Snohomish County is quickly becoming the location for major indoor sporting events," said Snohomish County Executive Aaron Reardon. "We welcome the athletes, coaches and their families to what we believe is the best part of America." "The 2012 Pacific Rim Gymnastics Championships is a wonderful opportunity for Everett to get an international close-up," said Everett Mayor Ray Stephanson. "Eyes from around the globe will be on us as Everett becomes the center of the gymnastics world for a few days next spring." All-session tickets range from $110 to $250 (including facility fees) and may be purchased at the Comcast Arena at Everett Box Office; by phone at 866.332.8499; or online through www.ComcastArenaEverett.com; or through participating area gymnastics clubs. In recognition of Visa's long-time support of USA Gymnastics, Visa is the preferred method of payment. The event will officially start with an opening ceremony sponsored by the Tulalip Resort Casino. The tentative competition schedule is: March 16, team and all-around finals for women's gymnastics and rhythmic gymnastics; March 17, men's team and all-around finals, and rhythmic gymnastics individual event finals; and March 18, men's and women's individual event finals, and men's and women's trampoline preliminary and final rounds. Everett Community College is an ancillary facility for the event. The Tulalip Resort Casino, one of the event's sponsors, will also provide rooms for delegations, invited guests and staff, in addition to sponsoring the event's opening ceremonies. Other local organizations assisting with the event are Everett Community College and Production Sports Management. "We are very pleased to be an event sponsor and official hotel of the Pacific Rim Championships, including supporting the opening ceremonies,” said Ken Kettler, president and COO of the Tulalip Resort Casino. “We look forward to helping the gymnasts, delegation members, and gymnastics fans learn about Tulalip’s Culture while they are here and to enjoy the excitement of Tulalip Resort and Quil Ceda Village." Held every two years, the Pacific Rim Championships traditionally feature gymnasts from Australia, Canada, China, Chinese Taipei, Colombia, Hong Kong, Japan, Korea, Malaysia, Mexico, New Zealand, Philippines, Russia, Singapore and the United States. NBC Sports will televise action from the Pacific Rim Championships. 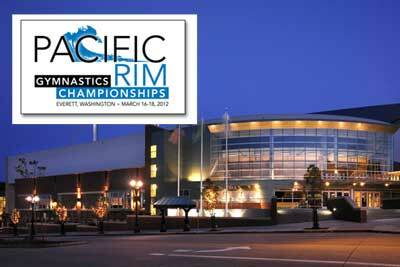 The 2010 Pac Rim Championships were in Melbourne, Australia, and the USA last staged the event in 2008 in San Jose, Calif.
Comcast Arena at Everett. The Comcast Arena at Everett, recipient of the International Association of Venue Manager's (IAVM) prestigious Venue Excellence Award 2010, was developed by the Everett Public Facilities District. The 10,000-seat venue hosts a myriad of events including concerts, ice skating and family shows. The facility is also home to the Everett Silvertips, a Western Hockey League franchise and the 2010 National Lacrosse League Champions, the Washington Stealth. The venue accommodates other sporting events such as basketball, volleyball and international skating competitions. Global Spectrum (global-spectrum.com) manages the Comcast Arena at Everett, as well as more than 100 other public assembly facilities around the world. Based in Philadelphia, Pa., Global Spectrum is part of Comcast-Spectacor, one of the world's largest sports and entertainment companies. Comcast Community Ice Rink. The Comcast Community Ice Rink is used for public skating, hockey leagues, figure skating and much more. The two ice sheets can be converted to form a 57,000 square foot space to host trade shows and special events. The three-story Edward D. Hansen Conference Center includes three 900 square foot executive meeting rooms, and an 11,000 square foot ballroom, which can be arranged in a number of different configurations. Everett, Wash., and Snohomish County. Everett, the county seat of Snohomish County, is home to innovative companies and industries producing everything from large commercial airplanes to tiny microprocessors. Just minutes north of Seattle, Snohomish County and Everett offer a diverse collection of urban delights and rural masterpieces and an endless menu of outdoor recreation and indoor attractions. Everett Community College. Everett Community College educates more than 20,000 students every year at seven learning centers throughout Snohomish County, with most students and faculty at the main campus in north Everett. Students come to EvCC to affordably start their four-year degrees, earn certificates, train for a new job, experience hands-on training in professional and technical programs, learn English, develop basic skills, finish high school, train for a promotion, or to learn just for fun. EvCC is also the home of the University Center of North Puget Sound, which offers more than 25 bachelor's and master's degree programs. For more information, visit www.everettcc.edu. Production Sports Management. Based in Snohomish County, Production Sports Management is an LLC offering sport national governing bodies, sports clubs and other community groups the support needed to take an event to the next level. Acting as the liaison between the local community and USA Gymnastics for the 2012 Pacific Rim Championships, Production Sports will be the eyes and ears on the ground to assist with marketing, public relations, sponsorships and event logistics. For more information, log on to www.productionsports.net. Tulalip Resort Casino. With exceptionally appointed rooms and suites and a warm, personal brand of hospitality Tulalip Resort Casino makes you feel right at home. In celebration of our Native American heritage our Seattle luxury accommodations feature vibrant Northwest Coast Salish artwork and textures. No modern comfort has been overlooked from complimentary Wi-Fi Internet and 47-inch flat screen HDTVs to stylish furnishings and bathrooms with Italian tile and granite countertops. With 30,000 square feet, our meeting and event spaces are orchestrated to ensure productive, efficient and trouble-free sessions, whether for a committee of 10 or a conference for 1,000. Rooms combine Coast Salish art with complimentary state-of-the-art presentation technology to offer distinctly elegant, highly functional spaces. Our casino boasts a 192,000 square-foot facility featuring nearly every game imaginable. With outstanding catered meals, luxurious rooms, spa and gaming facilities, and nearby shopping, golf and entertainment, it's easy to see why Tulalip Resort is regarded as one of the most outstanding meeting venues in the Pacific Northwest. Come discover the perfect blend of contemporary style and authentic Pacific Northwest culture at the only AAA-Four-Diamond-rated Washington luxury resort casino. In 1855, with the signing of the Point Elliott Treaty, the Snohomish, Snoqualmie, Skykomish and other Pacific Northwest allied tribes settled what is now the Tulalip Reservation. In the Lushootseed Salish language, the word for Tulalip is dxwlilap, which means "small-mouthed bay," a description of the body of water on the western boundary of our home.